Candida and cancer are two words that most people would not associate together. It is however a topic that is becoming more and more common. I frequently find myself answering questions about the link between the two. 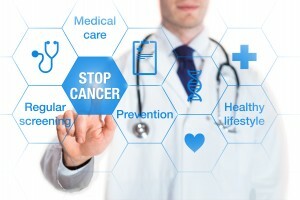 A large percentage of the population is heading into old age and the incidence of cancer is now more common than ever. I thought that I’d provide some background on how the two can be related. Candida is normally a yeast that lives beneficially in the body, but upon exposure to antibiotics, it converts to its fungal form. The fungal form spreads throughout the body and drives inflammation in many tissues and organs. Inflammation is part of the body’s defense response towards any infectious agent (bacteria, virus, fungus, etc). On a short-term basis, inflammation plays a helpful role. On a long-term basis however, it plays a role in driving many diseases including cancer. Fungal candida is the result of antibiotic use. If you’ve ever taken antibiotics, you’ll have fungal candida. If your body is functioning at least fairly well, fungal candida can exist and grow in your body without you becoming aware of it until much later on. The average candida patient, according to one hospital study, will have no symptoms. This can be due to the body’s amazing ability to adapt very quickly. Someone may never experience symptoms of candida until decades later. Left unaddressed, this hidden infection can lead to gradual deterioration and damage to the healthy tissues and cells of the body. Most cancers go undetected until they have become big enough to cause problems. Cancer researchers in the UK found that almost half of cancer patients are diagnosed too late. Antibiotic use itself has been linked to cancer. One study showed that even one pill could increase someone’s cancer risk by 50% and 100 days of antibiotics gives a one-to-one relationship with cancer at some point in a person’s life. 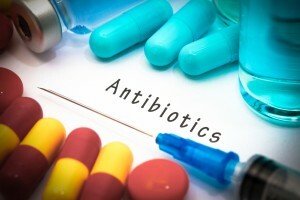 Antibiotics disrupt the bacterial flora of the entire body leading to a loss of balance in the immune system and subsequent run-away inflammation. This effect from antibiotics is first preceded by suppression of the immune system by antibiotics leading to greater susceptibility of the body to infection, disease, and cancer. By killing 100 trillion bacterial cells within 5 to 7 days, antibiotics cause a massive release of substances within bacterial cells that our body is highly reactive to. One of the major substances are lipopolysaccharides (LPS). LPS drives many pro-inflammatory immune responses that are tied to cancer development, growth, and spread. Some of the well-studied increases due to LPS are IL-6, COX2, NO, IL-12, IL-13, IL-10, IL-9, G-CSF, GM-CSF, CCL-3, CCL-4, NOX and NF-κB, IL-1, TNF-α, PGE-2, C-Reactive protein, and others. Additionally, fungal candida also drives many of these substances, as well as Matric Metalloproteinases that play a role in cancer. The loss of the beneficial bacteria leads to chronic states of inflammation. Eventually, inflammation creates changes in the DNA and RNA of the cells, leading to mutations in cells and tissues that become cancerous. Due to the long course of events in creating most cancers, cause-and-effect is a poor model in healthcare. What lies hidden and unseen for decades can have serious consequences later on. If we add chemical and heavy metal exposures and stress to the above, the likelihood of increase significantly. Being pro-active in our health choices and recognizing that fungal candida needs to be addressed can alter our future and impact our health tremendously.